Starting November 23, 2007, Tiger Airways will be joining Jetstar and Virgin Blue as one of Australia’s budget airlines. They have been flying into Australia from Singapore, but only up to Darwin. This year, they will be starting their Australian domestic services, with Melbourne as their hub. In Melbourne, Tiger Airways will be using Tullamarine’s Terminal 4. The first flight out of Melbourne on November 23 is flight TT 7402 Melbourne – Gold Coast at 7:00 am. Other scheduled flights for the day are two other flights to Queensland from Melbourne: Rockhampton & Mackay. Other Australian domestic destinations include Alice Springs in the Northern Territory, Sunshine Coast in Queensland, Launceston in Tasmania, and Perth in Western Australia. Gee, I wonder why they aren’t flying into Sydney. How much would flying via Tiger Airways to Australia cost? It’s easy to get around Sydney, even for a first timer. The public transport system is extensive, so you wouldn’t have to rely on costly taxis everytime. 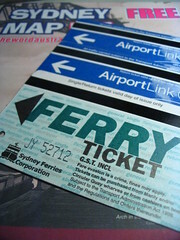 You can buy and pay for tickets everytime you board the bus, ferry or train. However, it’s more convenient to buy a travel pass, which can be used on all services. I give you three choices: the Daytripper, the Sydney Pass and the Travel Pass. Weeks before I flew over to Sydney for the weekend, I scoured all the websites I can read up on about Sydney and pored over every guidebook I can get my hands on at the library. 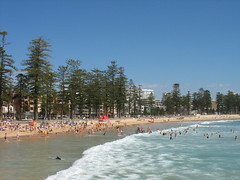 Almost all of my resources recommends going to Manly. On my second day in Sydney, I decided to spend my morning over at Manly and see what they’re raving about. You’ve been hearing me going on and on about the Chinese Friendship Garden (which really should be the Chinese Garden of Friendship. My bad), and it’s about time you know why. It’s truly a beautiful tranquil place. Built to celebrate Australia’s 200th anniversary, the garden is the local Chinese community’s way of preserving and sharing their rich cultural heritage. The garden was built with Chinese and Australian expertise and materials. For only AU$6.00, you can experience the centry-old traditions of Chinese landscaping, architecture and garden design. I’ll let the pictures do the talking.